People protest against unemployment and grievances in public administration in Iraq. Picture by Ameer Al Mohammedaw/DPA/PA Images. All rights reserved. As was the case in 2015 and 2011, this movement of protest started in the oil-rich province of Basra. This province suffers from a shortage of drinking water and electricity, high unemployment in addition to pollution, sanitary and health crisis that cause a proliferation of cancers. As the summer heat is reaching 125°F/50°C, the spontaneous movement of protest spreading in the Shi‘a south is showing its determination to stay away from formal political groups and any centralized organization. Composed predominantly of young men, its slogans are clear and go beyond the call for functioning state services. From sentences such as “there is no homeland!” to the slogan “No, no, no to parties !”, protestors call for radical political change. An essential feature of the protest movement is its violent repression by the Iraqi security forces and its attendant armed groups and militias led by members of the Iraqi political elite. 27 year old father of 3 children, Hayder al-Maliki was killed in June 2010 in Basra city center. Muntather al-Hilfi, 17 years old was killed in a township, north of Basra. Both were unemployed and peacefully demonstrating for electricity and state services when they were killed by Iraqi security forces. Their deaths pushed the local population to take to the streets and led to the spread of massive protests across the country. On July 8th, a group of young unemployed men gathered around the offices of foreign oil companies in the north of Basra to obtain their right to be employed. The Iraqi security forces violently repressed the demonstration killing Saad Al-Mansuri, a 26 year old father of 3. This mobilized the local population to take to the streets again and the demonstrations soon spread to other major cities in the south. In the first two weeks of protests according the Iraqi Observatory of Human Rights more than a dozen protesters have been killed at the hands of the security forces and various armed groups, more than 600 wounded and 600 have been arrested, many released after being brutalized and threatened. The harsh and bloody repression of peaceful demonstrations has been denounced by organizations such as Human Rights Watch. Tanks and armored vehicles have been used in the repression, so haveAmerican trained anti-terrorism forces that were involved in Mosul, as well as national police. For more than 10 days, the government cut the internet and telecommunication causing a loss of more than 40 million dollars a day. Prime minister Haider al-Abadi promised to judge the perpetrators while the Interior Ministry described the protests as “serial sabotage”. Through their media channels and statements, the Iraqi political elite is depicting the protesters as “saboteurs” led by “foreign agents” or Baath affiliates without any proof for these accusations. The Iraqi regime is structured by militarization and is a producer of political and social violence. The various armed groups and militias are deeply connected to the sectarian and corrupt political elite that came to power in 2003. Some of them have been institutionalized after their involvement in the war against the Islamist State in Mosul. Groups such as Hadi al-Ameri’s Iran-backed al-Badr brigades, Qais al-Khazali’s Rightous League, Ammar al-Hakim’s Ashura Brigades, Kataeb Hezbollah or Moqtada al-Sadr’s militia, were further normalised through their participation in the general parliamentary elections in May. Leaders of paramilitary forces and militias are now members of the parliament despite being responsible for the threatening, kidnapping and killing of civil society activists and many human rights violations in Mosul and elsewhere in Iraq. Some of these groups have also fought alongside the regime in Syria taking part in the ongoing war in the neighboring country. While there is now around one hundred different militias, instead of strengthening the civilian nature of the state and preventing the society’s militarization, the Iraqi government has allocated a stipend to 122 000 armed individuals in its 2018 budget while announcing a halt on government employment citing shortage of resources. What’s new in these protests? This time, protests in the Shi‘a south have not been echoed in the Sunni provinces, many of which have been destroyed in the course of the numerous battles that took place since 2003 until the more recent war against the Islamic State in Mosul. Millions of inhabitants, living in camps or in terrible conditions, fear the stigmatization of being associated with “terrorism” or seen as members of the Islamic State. The protest movement did not reach Iraqi Kurdistan either, despite the economic crisis in which it is plunged. What distinguished this wave of protest from the one in 2015 is that it is led by ordinary citizens and not by any organized civil society or political group. This lack of a centralized organization made its repression easier for the security forces. In 2015 the protest movement composed of organized civil society groups, part of the Iraqi left and Moqtada al-Sadr’s supporters broke into Baghdad’s Green Zone – the cordoned off and fortified zone of the capital where state institutions are located - and entered the office of the head of the government and the Iraqi parliament , the authorities did not use force against them. Since 2003, the fragmentation of the political system has reached new heights: sectarian divisions , privatization for the benefit of political leaders and their base, concentration of oil resources in the hands of a corrupt elite, all at the expense of the Iraqi population and ordinary citizens. The participation rate in the elections appears to be even lower than the officially announced 44,5% given the strength of the boycott movement stemming from many of the youth who participated in the 2015 protest movement. Even if taken seriously, the results reveal the bad performance of traditional figures of the Iraqi political life since 2003, including figures who are considered “secular” or non-sectarian. Numerous factors can explain the general exacerbation of the population and the decline of the political elite. The amount of internal and external debt has reached 45 billion dollars and the hindsight of currency reserves is below 50 billion dollars with a 2% monthly inflation. The poverty rate reached 30%, unemployment is estimated at 59% of the labor force (31% of precarious employment and 43% of long-time unemployment) especially among women and youth. This is while Iraq produces 4,4 million barrels of oil daily for a price of 40 billion dollars in the first half of 2018. Basra alone produces 3 million barrels of oil a day, and its 3 million inhabitants are facing a harsh deterioration of state services, a worrying salination of the water, terrifying diseases related to oil pollution and the spread of all sorts of dangerous drugs and narcotics. 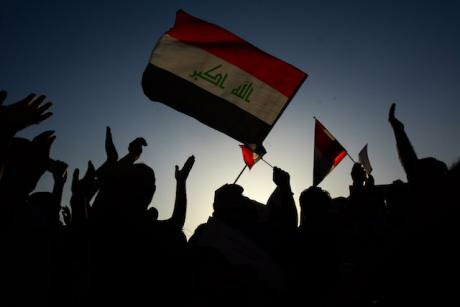 As an act of protest and in an attempt to contain popular anger, the Basra provincial council recently voted its autonomy from the central government. The council is also protesting against the blocking of the legal quota of $5 per barrel of oil that should be provided to the province to enable it to build its infrastructures and services. While the movement of protest is receiving support from Iraqi communities outside the country, the US administration is passive despite having funded and trained the Iraqi forces that are using live ammunition against demonstrators. Its embassy in Iraq expressed its support to the Prime Minister Haider al-Abadi for its “protection of the demonstrators”. The fragmentation of the Iraqi political system along communal belonging -ethnic, sectarian, religious lines- institutionalized by the US administration in 2003 provoked a state of generalized violence in the country. In the past few years, the hypermilitarization of the military groups dominating the Iraqi political life, justified in the context of the struggle against the Islamist State, has reached a dramatic level. The US administration and the international community are arming the Iraqi state instead of pressuring it to use its oil resources to enhance its basic services and infrastructures.